Dr. Sammy Lee was the first American of Asian descent to win an Olympic gold medal for the United States. The diminutive diver, just 5-feet tall, had to overcome much discrimination before attaining his goals: to be an Olympic Champion and to be a Medical Doctor. He had promised his father, "I'll do both," avowed Sammy. Dr. Lee went on to become an ear, nose and throat specialist. He studied pre-med at Occidental College and received his MD at the University of Southern California Medical School in 1947. Due to the outbreak of World War II, an urgent need for doctors arose. Sammy enrolled in an "accelerated program", completing the normal four-year curriculum in just three years. In the meantime, Sammy would squeeze in diving practice when he could. Practice was made even more difficult, because he had to combat discrimination and prejudice virtually every day. "I would practice at the Los Angeles Swim Stadium and Brookside pool," Sammy said "but non-Whites could use the pool only at Brookside one day a week, on Wednesday. And then the pool was emptied after we used it, and fresh water was brought in the next day." When the pool was closed to Sammy, he would often practice his diving form by jumping onto a sand pile. He got his big break when he came under the tutelage of renowned diving coach Jim Ryan. "Jim was a big Irishman, who stood 6'4" and weighed 275 lbs.," Sammy recalled. "He would take me to the Los Angeles Athletic Club, which was normally closed to the minorities. But no one dared to tell Jim Ryan that I couldn't come into the club with him." In 1942, at the age of 22, Sammy competed in the National Diving Championships and became the first non-Caucasian to win. The 1940 and 1944 Olympic Games had been canceled due to the war. Not until 1948, at age 28, could Sammy bid for his first Olympic medal. He astounded the world by winning a gold medal in the International Olympic Men's platform and a bronze medal in the 3 meter springboard. In the 1952 Games, Sammy won his second gold medal in the International Olympic Men's platform. At 32, he was the oldest person to win a gold medal in diving, and the first male diver to win back-to-back diving gold medals. A few years later, Sammy turned to coaching and not surprisingly, met with great success. He coached Bob Webster to gold medals in 1960 and 1964 and did the same with the great Greg Louganis, coaching him to a silver medal in 1976. The U.S. led a boycott of the 1980 Olympic Games in Moscow because of the cold war with Russia. It was about this time that Dr. Lee and his wife, Roz, discovered the PVA Shammy. 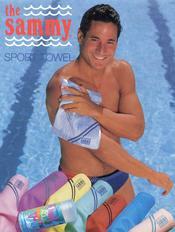 Sammy thought it was extremely convenient for practice dives - as regular towels became too wet. Roz tracked down the manufacturer and The Sammy Shammy was born. The rest is history! Dr. Sammy Lee was a second-generation Korean American who was born in the United States and served his country as a Major in the U. S. Army. His father was a dedicated patriot for Korean independence and was a close friend of Syngman Rhee, who was the first president of South Korea. Dr. Lee represented President Eisenhower, President Nixon, and President Reagan at the 1956, 1972, and 1988 Olympic Games. To date, he is the only Asian-American to have won the James E. Sullivan award as the U.S. outstanding amateur athlete. The 2012 London Olympics marked the 64th anniversary of Dr. Lee's gold and bronze medal wins at the 1948 Olympics in London. Dr. and Mrs. Lee attended the London Olympic games as guests of U.S. Diving and other friends and corporate sponsors. Dr. Lee turned 96 on August 1, 2016. Sadly, he passed away on December 2, 2016. Surviving are his wife, Roz, two children, Pamela and Sammy II, and three grandchildren. We remember and honor Dr. Sammy Lee -- for his life as a family man, a patriot, a physician, a coach and an Olympic champion! 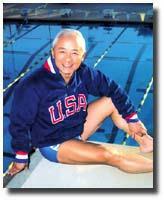 Dr. Lee Coached Olympian Greg Louganis. Greg also acted as a spokesperson by endorsing The Sammy Shammy.